I know you’re expecting a weekending post but I’m taking the easy way out and writing this post on Thursday to post today. I know the weekend will be busy and good and I’ll have stuff to share. But I also know that because of the busy and because of the Super Bowl on Sunday night, well, I might not have time to get a blog post ready for today. So, I’m writing this one early and I’ll catch up on weekend stuff tomorrow. We cool? Alrighty, then. Here’s my photo mosaic for the month of January, 2017. So many selfies this month. I think 5 is a new record. I blame it on the LipSense, frankly. There’s other good stuff, too, like flowers and games and knitting and food and even a baby and a cat. So much good and such a great month to remember. Hope you enjoyed this look back at the month that was, too. So much sparkle in January, love the specs too! Love all your photos (especially that antler yarn basket)! I must admit I wondered what you do for today’s post; would you write a “won” post and a “lost” one and publish the appropriate one? I should have known you would take the path of a true fan! Woo Hoo! Good Morning! The picks are beautiful! And if Brick isn’t too orange maybe that’s the one for me? Amazing how time passes. That picture of Mason by the heater still speaks volumes. I’m clearly slow to notice, but it looks like you use a quilt for a tablecloth. I’ve thought about this often, but wondered if the seams might make things more likely to tip over? I mean a spilled adult beverage would be sad for both the drinker and the quilt/tablecloth. The only thing I’ve thought about since last night is how happy Carole must be!! 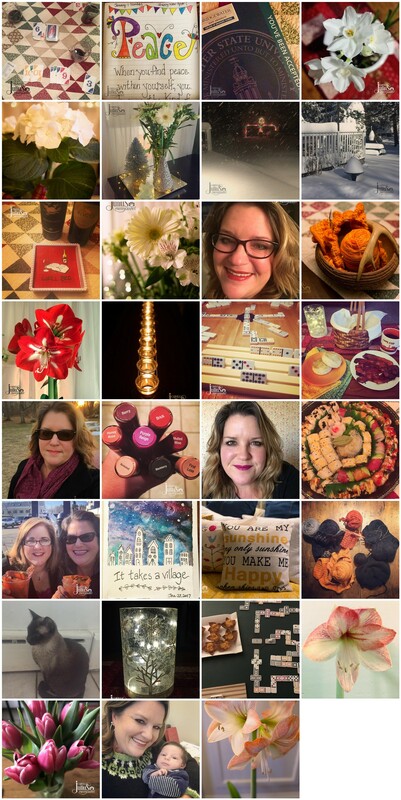 Love your collage and all the fun and beauty you show! A photo montage with a baby and a cat — what more could we ask for. Oh yes, a win for your Patriots — best Super Bowl game yet — usually they’re boring blowouts. Hooray for the Patriots! What an exciting game! And of course, I got my final 87¢ Dunkin’ coffee this morning. All of your flower photos make me want to brighten my desk at school with some blossoms! wow, it’s hard to believe New Years Day was just a month ago…seems like years! thank you for sharing the mosaic and reminding me(us) there is still lots to smile about and be thankful for.